This sketch shows the GTK docking system, as seen in Anjuta (and to some extent in Inkscape). The GTK docking system is like a tiling window manager in a window. This allows the layout of panels to be totally rearranged, or even detached into floating windows. These floating panels can be stuck together in a single child window. This would be a perfect way to span the workflow across 2 screens. For me, it’s this feature that most attracts me to GTK. IMHO it’s much better to make an interface out of standard bits (controls, fonts, colours) wherever possible. We really want to make Lumiera "like other apps", rather than making our own unique GUI elements just for this project - the way Cinelerra does. This makes it quicker for new users to begin work, and feel comfortable. Tango style icons mean the Lumiera will look consistent with Gnome, Windows, Mac and KDE - and the rest of the free desktop applications. Stealing ideas from Windows Movie Maker, it seems better to display transitions and filters in a way that shows the user what the filter will do to the video/audio, rather than using metaphors: like George Bush=Unsharp in Cinelerra. A jog tool is a sliding ui element that when clicked and held, will play the video at a certain rate as the mouse drags left or right. As the mouse drags the the left the video plays forward faster (It should advance very slowly at first.). It acts the same way when the mouse drags to the right, except that the video plays in reverse. Again, it can be tedious trying to make frame-accurate cuts to long video files. Without a jog tool it makes it more tedious to get to the exact frame you want to cut on because you must scan through, then click the next frame button half a dozen times. A jog tool would remedy this because one could easily vary the playback rate, even reverse it, zeroing in on the frame much more quickly. Together these two features could really increase the speed at which one can edit precisely in Cinelerra. The process for creating a DVD where Video and Audio have to be rendered separately is laborious. A script could easily handle this, and make the use of the program so much easier, attractive, inviting, productive, time efficient, bla bla. All the user needs to do is set the parameters and file name (once) and then "do". Many commonly used formats for saving could be saved as presets that completely avoid all the questions (say in the "File" drop down menu, as a customizable "Render AS" choice). This could also be done for HDTV, iPod, Ringtones, VCD, Various formats that give the best performance for uploading to Youtube and all the other video sharing sites. There needs to be a way of giving the user the choice to see the movie at full quality - computationally expensive, or at reduced quality for times when full framerate would be impossible. Let the user have more flexibility over the track view height. Some tracks can be set to minimal, others to visible (but basically iconic), others enough to see features, and one or two to good resolution. Some may even be blanked. Automatic Clip Creation based on video content. When scanning through an hour long video clip, it can be tedious to go through it all making clips. It would allow the user to get right to work if Lumiera could split the video into clips based on scene changes. Each clip would begin at precisely the frame the current shot begins and end at the last frame before the next shot. As long as the user could then edit these clips on the timeline, this would decrease the time spent sifting through the raw footage. 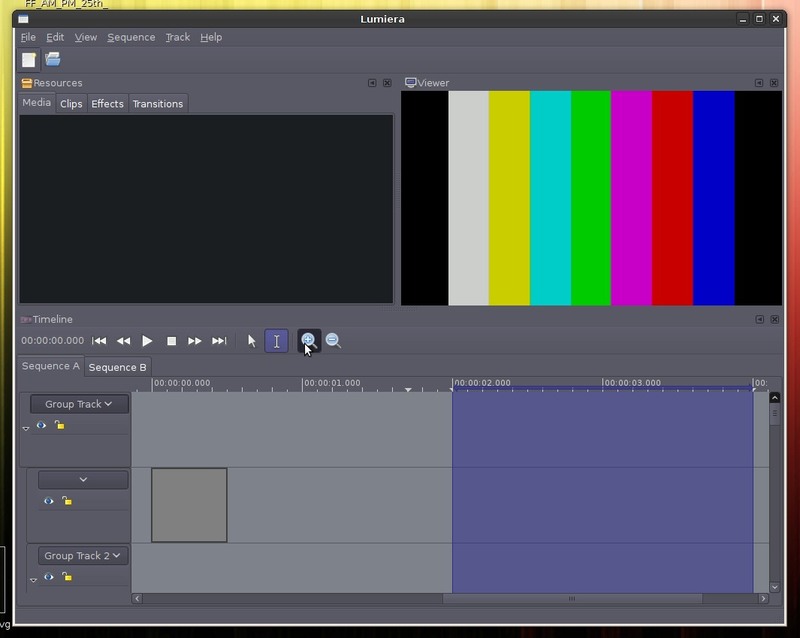 Many current cinelerra users probably use kino for their capturing of DV. it uses less resources, so less system demand during capture. Good display monitor while capturing. Open Movie Editor is a good multitrack editor that can share Kino’s SMIL files. A good progression in complexity of editing is start with kino, move to OME, then cinelerra (lumiera). A really convenient way to assist stepping up from Kino is to handle the SMIL files. Automatic scene detection is a great feature in Kino. The simpler editors make it easy for less skilled people to look after the selection of preliminary clips, while lumiera is used by the folks who put it all together, and finish it off. --Tree . Make the timeline view sparse, that means the time on top is not continuous anymore but 'boring' sequences get omitted and 'interesting' sequences get displayed, probably even stretched to cover at least a single thumbnail. This is the kind of features I have suggested in the Trackview section lower down the page. I like the name you give it - "Sparse" because it allows the user to not have to bother viewing OR scrolling past all the stuff in between two end points (or more items) just to tweak the ends of a segment. But I would emphasize that instead of reducing the width of the timeline because of the narrow time span needs for the one task, that more tasks can be carried out in the same view. This is because the view just misses out all the stuff in between, for each task. The advantage to this sort of work flow is that it allows an editor to very quick create an assembly cut of a film. During this phase of editing, the editor and director are examining the takes and deciding on which ones they like best. As such, it makes sense to be able to easily change the order of clips and add new ones to see how the shots fit together. I propose an assembly system where the source material is left untouched where effects are added on the fly similar to html and dtp packages. In this system the system is linked together using an node system similar to gstreamer and jack. Faders should have a "magnifying glass" mode, which can be activated by a key combination or modifier key. When activated, you can fine tune the current value: The step increment is lowered ideally to the real limit of the underlaying parameter, or, if this is too much, at least it should be much smaller than anything you get by dividing the possible value range by the fader length in screen pixels. In this mode, the fader doesn’t cover the whole range, rather it is centered at the current value. Changing the value by these small increments should give an obvious visible feedback. Ideally, an accompanying automation curve display will switch to the extreme vertical zoom as well. And it’s important that you don’t have to zoom, you enter/leave with one keypress. Time estimates for lengthy Tasks before committing to the action.